From Romantic Castles and Palaces, As Seen and Described by Famous Writers, edited and translated by Esther Singleton; New York: Dodd, Mead & Company, 1901; pp. 360-366. THE WARTBURG lies on the north-western slope of the Thuringer Forest at the top of a spur that commands an extensive view over the fruitful fields and woody Thuringian ridges. If the traveller has enjoyed the prospect during the ascent, he is engrossed by other feelings as soon as he has passed through the gateway into the old stronghold and mentally rehabilitates the entire castle as it was in days of yore. For the Wartburg is not only memorable as having been the abode for a century of the powerful landgraves of Thuringia who had their court here from the time this hold was built by Ludwig II. at the end of the Eleventh Century (1080 A. D. is usually considered the year of its completion) to the extinction of his line with Heinrich Raspe in the middle of the Thirteenth Century, but it has also acquired a classic repute in German history by three important occurrences: the famous Singer-war, the life of Saint Elizabeth, and Luther’s sojourn here. The Singer-war, also called the war of the Wartburg, was brought about, as is well known, by the Minnesong-enthusiast landgrave, Hermann I. and his art-loving wife, Sophia. In 1206, they assembled six of the most celebrated Minnesingers, — Walther von der Vogelweide, Heinrich von Ofterdingen, Wolfram von Eschenbach, Heinrich (the virtuous writer), 361 Johann Bitterolff, and Reimer von Zwethin, partly native and partly foreign, — and arranged a singing-contest among them. Heinrich von Ofterdingen sang of the knightly qualities of the Archduke Leopold II. of Austria; Eschenbach celebrated the fame of the King of France; and Walter von der Vogelweide, the preëminence of the landgrave Hermann; whilst the other singers extolled other princes. But this gave rise to a serious strife, and the irritated contestants agreed (so it is said) that the defeated singer should die by the executioner’s hand. The landgrave strongly forbade such a bargain over his undertaking, but nevertheless when Ofterdingen was declared the loser, the protection of the landgravine, to whom he fled, was necessary to save him from his adversaries. The landgrave adjusted the quarrel by arranging a new contest, to which Ofterdingen had to fetch from Hungary the world-famous meistersinger, Klingsor, to act as umpire. About a year afterwards, therefore, the latter appeared with Ofterdingen and the contest began again. Klingsor, however, would not decide in favour of any one singer, but rather sought to reconcile the parties. In this he was successful, and so the “War of the Wartburg” ended in feasting and revels which the landgrave provided. 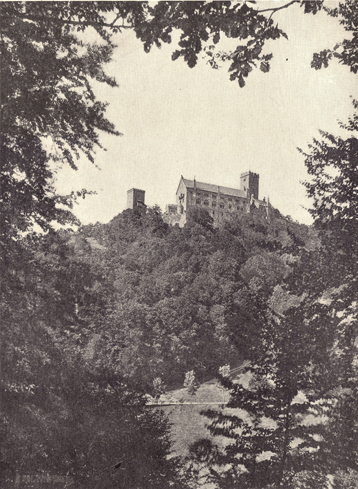 Although its original features have been destroyed, the Minnesinger Hall in which the contest took place still stands, and might easily be restored; but fragments of the poems of the Wartburg war are preserved in the Maneseichen, Docenschen, and other collections. It has been held, however, and not without good grounds, that the poems still 362 extant of that contest were first collected a century after it was held. It seems certain, nevertheless, that the kernel of the matter is largely contained in these collections. Luther had left the Diet of Worms; he had been outlawed, and the safe-conduct granted to him by the Emperor Charles V. was soon about to lapse, for it was limited to twenty-one days. His friends and protectors therefore feared for his life, and, in order to hide him, Luther was snatched up by masked servants while passing through the Thuringer Forest, and brought to the Wartburg. It is scarcely to be doubted that this happened by the contrivance of the Kurfurst Friedrich, although at first he may have avoided all knowledge of Luther’s retreat, in order to be able to meet all official inquiries. Luther arrived at the Wartburg in May, 1521, under the name of a knight Görg. Here, for nearly a year, he lived in a little chamber, in a wing to the right of the chief tower, very simply adorned and furnished only with the barest necessaries. It still exists in its original condition, and it is with awe that the visitor enters the little abode wherein the great man partly accomplished his undying work, — the translation of the Bible. 363 The castle chapel in the landgrave’s quarters still contains the pulpit from which Luther often preached to the inmates. The ridge on which the castle extends from north to south is long and narrow and of very irregular form. It was formerly entirely covered with buildings that surrounded the inner courtyard. The single main entrance originally consisted of three or four gateways constructed one behind another with intermediate spaces, on the northeast. The outermost of these, supplied with a high tower, stood close to the narrow and steep approach which is cut in the rock and leads to the top of the mount. This outermost tower, it is conjectured, overhung this steep path, so that in case of attack the foe might be more easily repelled. The innermost gateway, which led into the stronghold itself, is the only one now standing. Formerly it was furnished with a drawbridge which recently has been changed to a strong bridge of stone. Above the gateway, rises the so-called Ritterhaus (knight-house) which retains evidences of having been much higher formerly than it now is. It probably formed the tower-gate which, in 1558, was partly 364 demolished and brought into closer relations with the other buildings. The Ritterhaus served as the dwelling of the knights whom the landgrave assembled about him for the defence of the castle: it is now the dwelling of the Castellan. The style of those buildings still standing shows that they belong to the Fifteenth Century, and only the lower part of the walls is of the date at which the castle was founded, at the end of the Eleventh or some time during the Twelfth Century. The relief carved on the wall over the gateway also belongs to the same date. Its meaning cannot be solved. Popularly, it is called the Jonah; but it represents a knight about to be devoured by a dragon. The coat-of-arms hanging at the knight’s neck appears to bear the imperial eagle. Another perhaps equally ancient relief, which is found on the west wall not far from the square tower, is also to be noted. It represents a man sitting on a lion and tearing its jaws apart: it refers to the fact that the landgrave Ludwig the Good once single-handed bound a lion that his father-in-law had sent to him, and that had escaped from its cage in the courtyard. Through the door under the Ritterhaus, we enter the courtyard of the Wartburg, and see to the west one of the continuations of the Ritterhaus, Adjoining this to the south, are other buildings; among others, that containing Luther’s chamber. On the left, to the east, runs a long high wall from the Ritterhaus to the chief building standing on that side. This wall is covered with a defence-way of very simple form resembling those still occasionally found 365 in old city walls. The first chief building already mentioned on that side was formerly called the Musshaus (house of ease and leisure). Between it and the above-mentioned wall at the end of the courtyard, was originally a high wall with a wide doorway, so that the whole rear part of the castle, the residence of the ruling family, was separated from the front part where the knights and attendants dwelt. According to ancient report, the Musshaus was only a tall, plain block, though the interior was not devoid of luxury, and here the landgrave’s family dwelt. Adjoining the south side of the Musshaus was the Landgravenhaus (landgrave-house), also called the great or high house, which was devoted to ceremonials in the days of the landgraves. It is a stately structure that originated perhaps in the time of Ludwig III. in the middle of the Twelfth Century. In Germany it stands alone as a princely private building of such dimensions that still preserves its original form in the Byzantine or Roman style of architecture. In these respects, there is no ancestral secular building that can compare with it abroad also. On the west, it is connected with the Minnesinger Hall which formerly formed the chief entrance to the above hall through broad windows, divided up into round arches by little columns, for the other three sides had no entrance. The columns rest upon a low sill, so that people can look between them into the hall; so that it is to be presumed that the passage thus formed was intended for spectators. The little columns are ornamented with delicate capitals and volutes. They have Attic bases. In the time of Friedrich I. this hall was 366 adorned with mural paintings of battles and other memorable occurrences of the life of that period. Traces of these paintings were still visible at the beginning of the present century.